OK. I'd take with the queen, both on principle and because I know a little of the theory, but I suspect that people are taking with the pawn because they think Black is going to play ...Bf6 and ...c5. Either Stauton or Morphy once took in a very similar position with the pawn, but through modern eyes that's obviously not the done thing. For what it's worth, I'd recapture with the queen, too; but then I wouldn't have played 7..Ne4, because of 8.Nxe4 fxe4 9.Ne1 d5 10 f3. Come to think of it I wouldn't have played 1..f5 either becuase of the Staunton Gambit. But then I never understood the Dutch; though I suppose that's my problem. I rather suspect that with the Queen on d3 (rather than c2) it IS objectively better to take with the monarch rather than the lowly pawn. With the Queen on c2 though ... EJH you seem to be saying current theory suggests that even then Qxc3 is objectively the right choice. Well I'll take your word for that - although bxc3 must be highly playable too. Shirov played it, for example. you could always play 1. ... e6 and 2. ... f5 thus avoiding the Staunton. Perhaps then you wouldn't fancy a transpo to the French??? 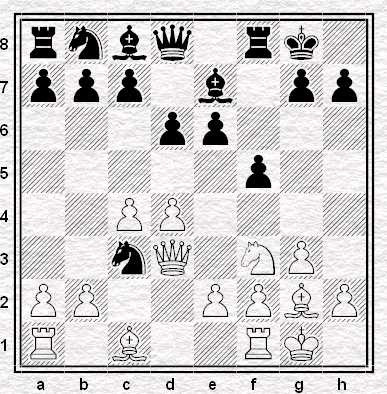 1d4 e6 2c4 f5 3 e4 & Hey Presto: Staunton Gambit Deferred. well you may have convinced me last night that the Staunton Gambit Deferred is not completely terrible but I still can't quite believe it's as good as the Staunton itself. I found a secondhand copy of NIC Yearbook 78 in the Baker Street Chess & Bridge shop today. Simon Williams' article on 7. ... Ne4 concentrates mostly on 8. Qc2 and then ... Nxc3, 9. Qxc3 rather than 9. bxc3 so perhaps it's objectively after all. As a reformed Dutch player myself, I consider bxc3 a mistake. That said, the white position can stand the worsening, and the position remains difficult for both players. It all comes down to piece activity, like in some theoretical Nimzo or English positions where white takes bad pawns but still fights for the advantage. Shirov is a genius, he can get away with a bad move once in a while. As for the theory, I no longer have Bellin's old book on the Classical Dutch, but I do have Pinski's 2002 book by the same title. 7...a5 8.Re1 Ne4 9.Qc2 Nxc3 10.Qxc3 (10.bxc3 Bf6 ... Suba - Pamers, Suances 1997) 10...Nc6 (0-1,35) Gallagher - Williams, Port Erin 2001, plus 2 games with 10.Qxc3 Bf6, plus 1 more game with 10.Qxc3 Nc6 in the notes. 7...Ne4 8.Qc2 Nxc3 9.bxc3 (1-0,63) Marin - Hamdouchi, Sitges 1994, plus 2 more games with 9.bxc3 in the notes. 9.Qxc3 "This recapture is more natural than 9.bxc3." Bf6 10.b4!? c5 (1-0,32) San Segundo - Vega Holm, Cala Galdana 1999, plus two more games with 10...Qe7 in the notes. 9.Qxc3 Bf6 10.Rd1?! 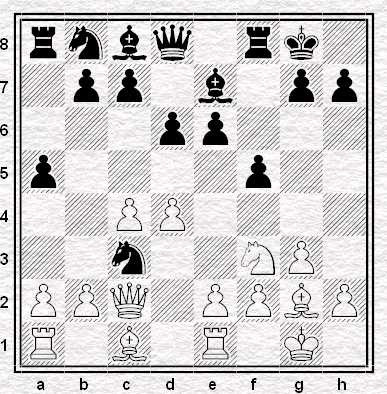 Qe7 (1/2,33) Czebe - Varga, Zalakaros 2001, plus 1 game with 10.Be3 Nc6, plus 1 game with 10.b3 Qe7 in the notes. So Pinski does not actually question bxc3, but his Qxc3 lines all lead to +=, and his bxc3 lines do not. Based on that it should be bxc3? !.